Organic. Just add milk.A specially brewed spice tea with an exotic blend of cinnamon, ginger, cardamom and cloves Serve your spirit Close your eyes, inhale and let the rich, exotic aroma of cinnamon and ginger transport you to a world where the ancients created the perfect cup of tea. Yogi Chai's Indian Spice recipe has been handed down for thousands of years. 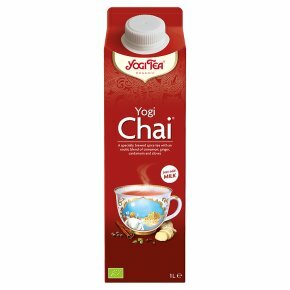 Spicy, sweet and stimulating, YOGI Chai® will inspire with its delightful taste and soothing warmth. Mix 1/2 Chai, 1/2 Milk Heat Enjoy! Preparation Shake well! Combine equal parts of YOGI Chai® and milk (or milk substitute). For a stronger taste add less milk. Heat on a stove or try these delicious variations: Yogiccino Prepare like a traditional cappuccino with steamed milk and a sprinkle of cinnamon. Chai-der For refreshing and warming fruity alternative mix equal parts YOGI Chai® with apple juice and add a dash of lemon. Great for kids. Yogi spice on ice Pour equal parts of cold YOGI Chai® and milk over ice. Also a delicious treat with vanilla ice cream. Serve hot or cold - makes 2 litres!